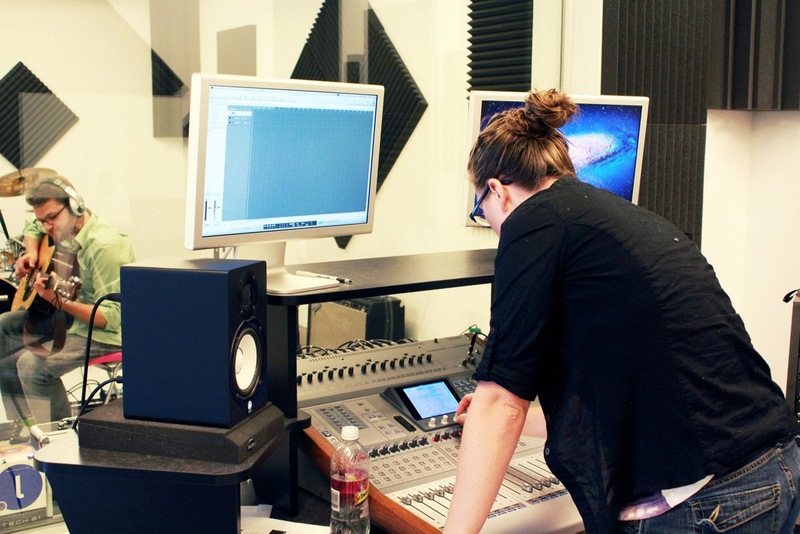 A Day in the Life of an Audio Production student at The Digital Arts Experience. My student (we’ll call him Joe Shmo) comes to me with a project in mind. He is a junior who wants to create a guitar recording to help him get into a Jazz Studies program in college. We begin the class with the basics, and I show my students (there are never more than six) a PowerPoint presentation (with several YouTube clips embedded) about the recording process. I give them a quick tutorial of how to make a home demo using Garage Band, and have them do a one-minute group project using the technique. Meanwhile, Joe must make a decision on what to record. He must practice. When he goes home he plays a couple of songs for his mother, who gives him helpful feedback on his timing. Then he does a quick recording of the songs he’s chosen, uploads them to SoundCloud, and posts them to Facebook. He asks his friends and family to vote on the selection they think is best. His uncle sends him a helpful article on a finger-picking technique that would work better in the B section of the first song. After receiving the feedback, he’s decided which tune he will record, and returns to us to make it happen. Here at The DAE, he must go into the live room to set up his own amp and microphones, connect cables in the correct manner, and warm up so that he’s ready. If he doesn’t know how to do something (which happens quite frequently), he has to ask. A member of his class is in the control room manning the console and operating Logic. She must record-arm tracks within the software and check that the sound levels aren’t too high or distorting. Someone else must communicate with Joe, who is on the other side of the glass. “Miss, how do I get him to hear me?” one student asks. I don’t say a word. “Press that button to your right, it’s called the talkback.” says another student – connected learning at its finest! Joe finishes his recording. He’s got a great-sounding project. Then, I send him to our Photography department, where the students there take some amazing photos of him. He brings his photos to the Graphic Design department, where the students there create a professional-looking package for his demo CD. At the end of it all, a student from the film department records and edits a simple music video of Joe playing his song live, so that he can put it online and link it to his college applications. And voilà! Mission accomplished, and then some. The moral of this story is this: I did not teach Joe how to record. Instead, we at The DAE provided an environment in which the people in his network could support his quest to record the perfect demo. Parties involved included his mother, his Facebook friends, his uncle, his fellow classmates, and the photography, graphic design, and film departments within The Digital Arts Experience. In addition, he was able to use resources such as PowerPoint, YouTube, SoundCloud, GarageBand, Logic, Final Cut, and Photoshop. In essence, the process of connected learning is exactly as it sounds. It is the concept of evolving by being connected to those around us, as well as being invested in what we are learning and teaching. Those are the concepts we’re trying to foster here… one experience at a time.